Katherine Burdick, a Cadets baritone player from 2003 to 2005, submitted this pic. "This picture was taken in the basement of the YEA! office a few days prior to move-in for spring training. Kevin Shealy and I were both up in Allentown, Pa., in the YEA! office participating in the annual Maroon and Gold club call-a-thon. We were cleaning out the YEA! 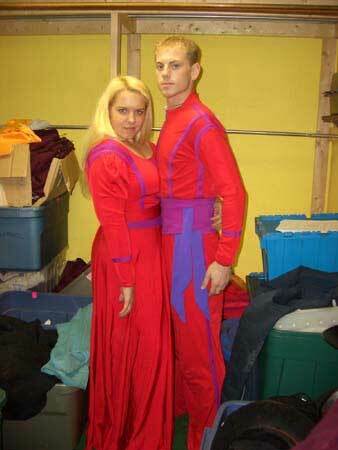 basement when we discovered old Cadet guard uniforms. So we ended up trying on some of the Cadets 2003 guard uniforms and proceeded to run around the YEA! office with rifles and sabres singing "Malaguena" at the top of our lungs. Thanks Katherine! E-mail your best shots from the summer to dave@dci.org along with where and when the photo was taken. Send some biographical information about yourself as well. We'll give you full credit. Also, let us know if you want your e-mail address included.